The manufacturer simply calls it a "tie pot." One look at a picture and you see why: those knobs all around the outside rim are made to be anchor points for guy wires. 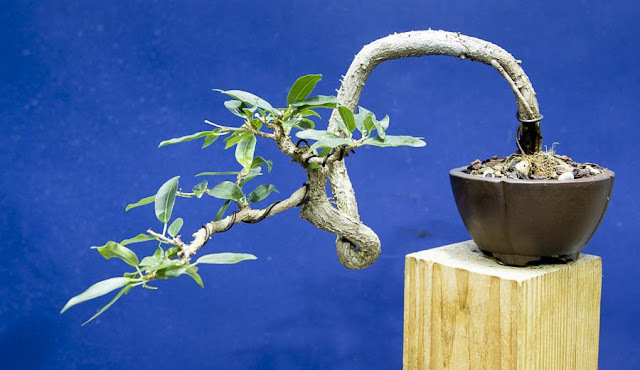 A "tie pot" for bonsai-in-training. 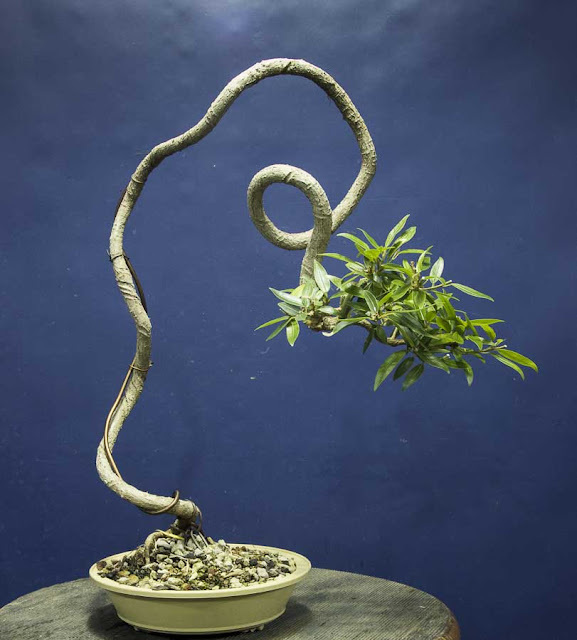 Guy wires can also be useful when shaping a bonsai-in-training. Sometimes a guy wire can pull a branch into position as effectively as wrapped wire. It can be left in place for years without danger of significant scarring, a consideration useful with trees that take a long time to set in a new position, such as ponderosa pine. And if a guy wire is thin it is much less noticeable than wrapped wire if the tree is displayed. Close-up of the anchor knobs. The whole pot is sturdy, made from high-impact plastic. I tried flexing the pot wall between my hands, using a good deal of force, and it would just barely flex. In normal bonsai use it won't flex. This matters because if a pot wall flexes, the soil mass inside it gets flexed; that means that the roots inside the soil get flexed, and that means broken feeder roots, because roots aren't made to flex like branches are. These pots are also designed to promote air-puning, another worthy feature. For any who don't know, "air-pruning" is the term for what happens when a root grows out into the open air. The exposed root tip dries out and dies, and the plant seals it off. Then the part of the root still in the soil branches to the sides, and voilà, you are that much closer to a compact, well-branched root system close to the trunk. And because the old root tip is sealed off rather than cut or broken, there is no break in the root's surface thru which pathogens can enter. I'm sure most of my readers know what a plant's roots look like when it's been grown in a standard round, smooth-walled nursery pot. The roots grow out horizontally until they hit the wall of the pot; then they grow down to the bottom. Then, once they can go no deeper, they start to circle round and round at the bottom of the pot. The result can look like a clump of long-strand spaghetti! Internal ridges to guide roots down to holes to the outside. Notice the narrow shelf running around the inside of the pot, about two inches above the pot floor. Notice that wherever that shelf is intersected by a ridge, there's a little ramp on either side, leading down like a funnel. Those "funnels" guide the rootlets to openings to the outside, as the next picture shows. Root tips that enter the side holes (previous picture) emerge from these downward-facing openings. Forgive the blurriness of the next picture, but I don't have a better one. I held the pot up to the early-evening sky to show just how many holes the bottom of the pot contains. All those holes give root tips access to the outside air. The eight largest holes that form an inner ring should also serve adequately for drainage. They are each only about a half-inch across, but there are eight of them. A view against the sky to show all the holes! I haven't yet had my hands on both the pot and my tape measure at the same time, but I can say the pot's diameter is very close to 8 inches at the bottom and 12 inches at the rim. Internal depth is about 4 inches. I estimate it will hold between one and one-and-one-half US gallons (roughly 3½ to 5 liters). Here's a picture with a standard 12-ounce beverage can right in the center. Stone Lantern is one of those vendors that I recommend in the sidebar; for their website, click here. Wayne Schoech and his crew sell a wide range of bonsai-related supplies, and I've never been dissatisfied with anything I've bought from them. For the English version of the tie pot manufacturer's website, click here. They sell other pots besides. Obviously I have yet to grow anything in my new pot, but I expect it to live up to the claims about it. And I believe I have an appropriate candidate for its first occupant: this dwarf yaupon holly (Ilex vomitoria 'Schilling') that I got last summer in a workshop with Adam Lavigne of "Adam's Art and Bonsai." If any of tree of mine will need guy wires to keep it stable after repotting, this will be one. Look at that hollowed and twisted lower trunk! Dwarf yaupon holly, first in line to spend a year or two in the tie pot. Give me a couple of years and I'll write a follow-up post on my experience with my new container. I could almost title this post, "Learning some things in spite of a mistake." The mistake I refer to was my own. I'll get to the reason I could say that, in a little bit. The Fort Wayne Bonsai Club has enjoyed an influx of new members recently. 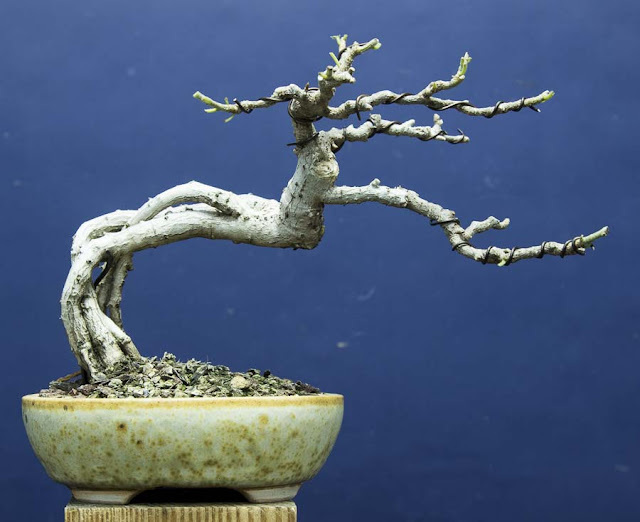 For their benefit, and because we old-timers can always learn more, we invited Mark Fields, owner of Bonsai by Fields LLC in Indianapolis, to teach a session on wiring at our November meeting yesterday. Because it was my idea and I've known Mark for a number of years, I was the one who made the arrangements. Mark Fields has been interested in bonsai since the age of 9, when he asked a neighboring nursery owner why the man had weights hanging on the branches of some mugo pines. Over the ensuing half-century he has developed his skills studying with multiple teachers in the USA, Europe, and Japan, served as an officer in a number of bonsai organizations - he is currently President of the American Bonsai Society - and taught and given demonstrations in too many venues to name here. For more about his bonsai career, click here. But Mark did his best, and he still gave us a session worth anyone's Saturday morning. 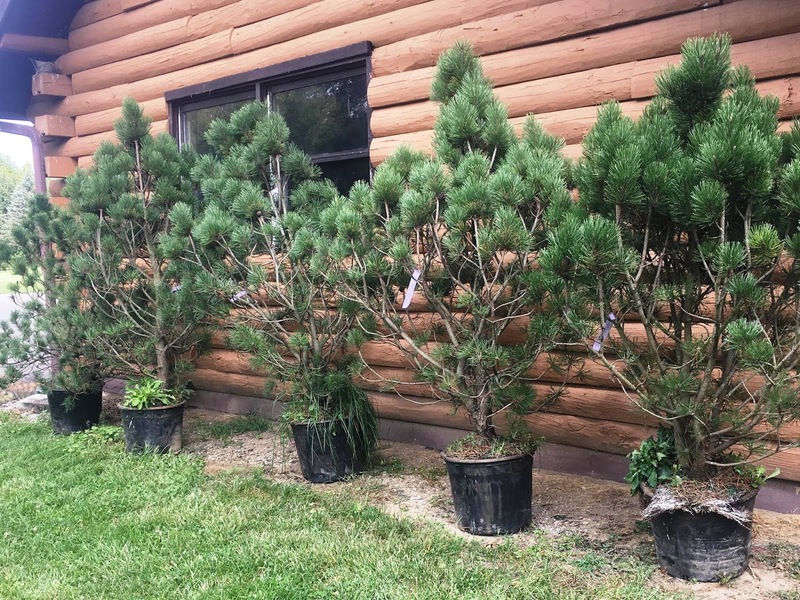 The club recently received five fairly large potted pines as a gift from a local nursery, Blue River Nursery. Four of them will best go in someone's landscape, but the fifth, a lodgepole pine (Pinus contorta 'Spaan's Dwarf'), has definite bonsai potential, and was selected for what followed. The five gift pines from the Blue River Nursery, Columbia City. The one chosen for the work is at the far end of the row. Mark Fields assessing the tree chosen for the morning's session. Mark's best and most natural teaching mode (it appears to me) is not lecture, but to teach and explain as he works. So we lifted that lodgepole pine onto a table in the garage of club co-president Pat Guido, and gathered around. Mark started working and talking, explaining the whys and wherefores of wiring as he went along, stopping sometimes to answer questions or expand on a point he had just made. All the time the first shaping of a pine bonsai was beginning under his hands. Mark explains a point while he works, as Bob Mortenson and Bruce Kennedy watch carefully. He was assisted by his son Lincoln, whose interest in bonsai started at an even earlier age than his father's. Lincoln has already shown some of his bonsai in various venues, including the Indiana State Fair and last year's MABA convention. Besides being his dad's gofer and tool-finder, he created a jin on a branch stub his father indicated, and then suggested a shari leading from the jin down to the soil line. Mark looked at the spot, thought for a minute, and then concurred; Lincoln went to work. His work on the jin finished, Lincoln starts carving the shari that his father approved. As it turned out, and using the term I suggested in this post's title, the morning might best be called a "teaching demonstration." 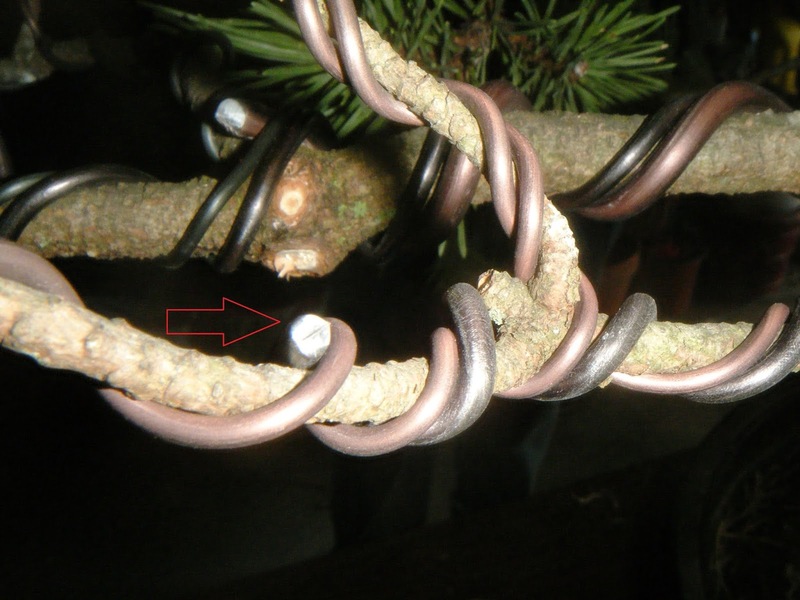 Mark wired and shaped the pine's first major branch, including its secondaries. As he did so, he demonstrated and explained a number of the important concepts of wiring, including selecting the proper thickness of wire for a given branch, anchoring, transitioning to a smaller gauge, wire position at a bend, and other aspects. There was no time for supervised practice as I had envisioned - again, four hours would barely have been enough. Even so, the session served its purpose: I think even the most experienced members learned something about wiring that was new to them. I heard a number of comments along the lines of "This is so helpful," "I'm learning a lot," and at least one "This is great!" Our sincere thanks to Mark and Lincoln! Mark's nursery is only about 2½ hours' drive from Fort Wayne, and he will soon resume his practice of holding open workshops on Saturdays. Our people are already talking about a field trip to Bonsai by Fields next spring or summer. Last picture is of one new thing I learned: when it's actually OK to cross wires! Red arrow: it's acceptable to cross wires when one secures the end of the other. ... over, and over, and over again. So it has been for much of the last several weeks. Days with highs above freezing followed by nights with lows below freezing, one after another, are almost starting to feel like "the new normal!" This weather pattern has been playing merry hob with my temperate-zone trees' spring responses. My American larch is typical, I think: Normally, from first green to full bud burst takes about a week, in my observation. But the first green - bud break - appeared several weeks ago, and as yet none of the buds have opened enough for individual needles to be distinguishable! I can't help but be concerned that this abnormally extended pattern of freeze-and-thaw will do some injury to new and still-tender foliage. In an effort to buffer conditions for my cold-hardy trees, I decided to put up a small inexpensive greenhouse to hold them until temperatures are no longer doing their winter-to-spring-to-winter dance. My wife came across this product on-line; it measures 7 feet by 10 feet (a shade over 2 meters by an even smaller shade over 3), assembles in a couple of hours, and costs less than $80 US. I plan to keep it to use in future years as a temporary spring shelter for newly-repotted trees. Temporary plastic greenhouse to moderate temperatures for temperate-zone trees. We recently moved, and our new location is windier than I expected. The tie-down equipment that came with this greenhouse is as inexpensive as the rest of it - OK, it's cheap. And a little story Ryan Neil told in a Mirai Live stream some weeks ago wouldn't leave my mind. Rather than provide a mini-sequel to Ryan Neil's story, I decided to add my own tie-downs to what came with my little greenhouse. My anchors are dog-tethering stakes - the kind with a business end like a spiral auger - and I used 3/16" nylon twine (almost 6 mm). My measures seem to be adequate: the wind picked up this afternoon while I was moving the trees into the interior, and while the plastic cover flexed and snapped and the tubular frame flexed slightly, everything stayed in place. A closer view of the tie-downs. I decided on the Lilliputian approach: more thin ties instead of fewer thick ones. The greenhouse is unheated. The trees' containers are resting on a single layer of landscape fabric on top of the soil, so get a bit of heat seeping up from the earth. The greenhouse itself will block the wind, and will reduce heat loss at nite by a few degrees, I expect. I put a min-max thermometer inside so I can monitor the temperatures. Here are the trees inside, ready for the door to be rolled down and zipped shut for the nite. The greenhouse holds all my hardy trees, with the exception of my largest, a Thuja occidentalis, a.k.a. American arborvita. It's as cold-hardy as a musk ox, tho, so I could safely leave it outside on the sheltered side of the greenhouse. A friend of mine once remarked that for some people bonsai is a pastime, while for others it is a passion. If a six-year bonsai contest won't show who's passionate about the art of bonsai, I don't know what will! That's what the Bonsai Nut forum recently launched: a competition to see who can grow the most bonsai-worthy Japanese black pine (Pinus thunbergii) from seed over six full growing seasons. The contest started January 1st, 2018. Contestants could acquire seeds and get their supplies ready before that date, but nothing more. The contest will close at 11:59 PM on December 31st, 2023. I find pines a bit fascinating, maybe because I rarely saw them while growing up in Ecuador. So I decided to jump in. I had received some JBP seeds (along with some Japanese maple and trident maple seeds) several years ago as a freebie for ordering a certain minimum amount at one time from Dallas Bonsai, and still had them. The packet of Japanese black pine seeds, 'Sanshu' variety, imported from Japan. There were 30 seeds in the packet. After 24 hours soaking in (initially) warm water, all but one had sunk to the bottom of the cut-down styrofoam cup. JBP seeds starting to soak. After they finished soaking, I spread them between two sections of paper towel and wrapped damp sphagnum around paper towel and seeds. Everything went into a polyethylene bag, which was labeled and placed in the refrigerator. My wife and daughter were told they were there, to make sure the bundle wasn't mistaken for sauerkraut gone bad or something equally repulsive to their sensitivities, and discarded! The "remove" date was also noted on Google Calendar. Three days ago, after 60 days of cold stratification, I took the seeds out and planted them. I decided to use peat pellets, the ones that expand into fat little barrel shapes when wetted. One seed went into each expanded pellet. on the left is mold on the seed itself, or something that was in the sphagnum. Planted and ready. The "envelopes" around the peat pellets are biodegradable. Humidity covers in place. These "micro-greenhouses" will be easy to move whenever necessary. It remains to be seen how many of the seeds are viable; they sat on the shelf for at least three years before being planted, maybe longer. But I've never heard that the seeds of any pine have short viability periods, so I think I have reason to be hopeful. And speaking of hopeful: after entering the contest, I told my wife, "Now I have to live to at least 71 years old, in order to win this contest!" 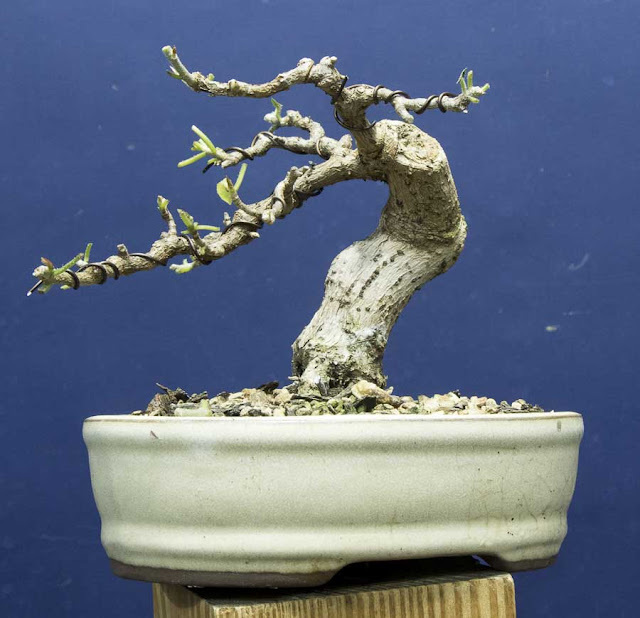 If you would like to check out the Bonsai Nut forum, follow this link. "Budget" Doesn't Have to Mean "Uninteresting"
Many of us are practicing bonsai on a budget. There are different reasons. Maybe our budget will only stretch so far. Maybe other pursuits are higher in our personal priorities than bonsai. (I'll forgive you.) Maybe we don't want to spend a lot on bonsai material until our skills improve. He went on to say, "Now I know that some really nice stuff can be made if one is willing to go with certain styles of bonsai." Earlier that day Jerry had posted a composite picture of some of his recent creations, saying, "Many bonsai lovers have difficulty since their only material is young and long, and not showing huge bases and [an aged] appearance. For some years I have been working with young, long and uninteresting material. I think you can do the same thing and create some fun bonsai." Here are some of the pictures from the composite, full-sized and used with permission. For a sense of scale, it looks to me as if all but the third are resting on an upright piece of standard 4" x 4" lumber (approximately 10 cm x 10 cm). All photos by Jerry Meislik. No commercial use without permission. Some of the trees were recently defoliated, which allows more of their structure to be seen. While the trees show different styles (semi-cascade, slanting, etc. ), most also show the bunjin (literati) variation. 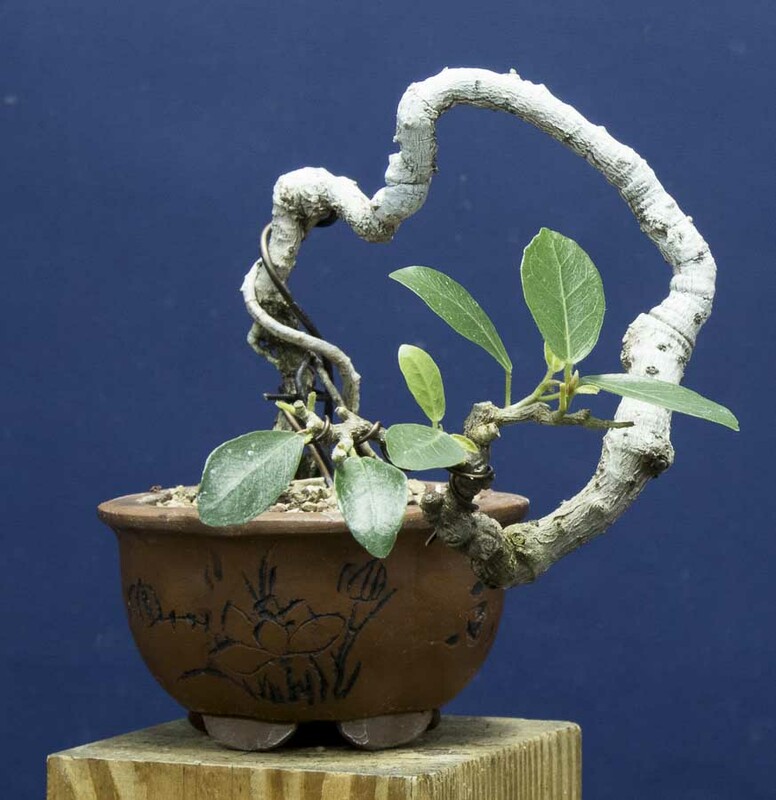 All the bonsai in the pictures are Ficus, grown from cuttings from Jerry's larger trees, but there are other species and genera that can be used for the same purpose. Among tropical species, parrot's-beak (Gmelina), bougainvillea and schefflera are quite flexible when young. The same is true, if not to quite the same degree, for some temperate species, particularly in the pine family (Pinaceae): pine, spruce, hemlock and others. In addition, young and thin stock of almost any species can be used for multi-trunk and forest plantings. So, as Jerry's pictures demonstrate: if you are willing to work within certain limits of size, style and species, there is nothing to stop you from creating eye-pleasing, personally satisfying bonsai!